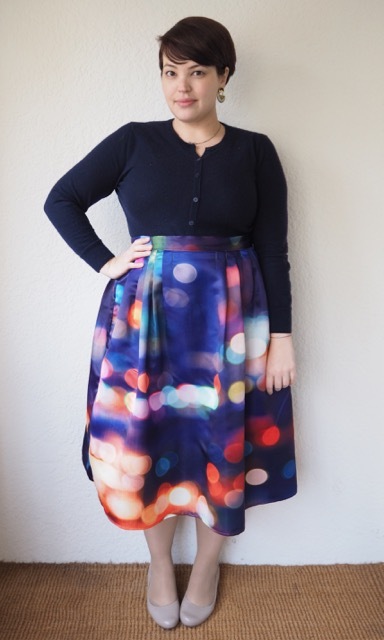 I love the print on this “Neon Lights” midi skirt from Chicwish. It reminds me of streetlights on rainy nights, and confetti, and has such glorious rich colours. I fell hard for it when I saw it for the first time but was destined to be disappointed, because the largest size (the XXXL) was still too small for my waist. 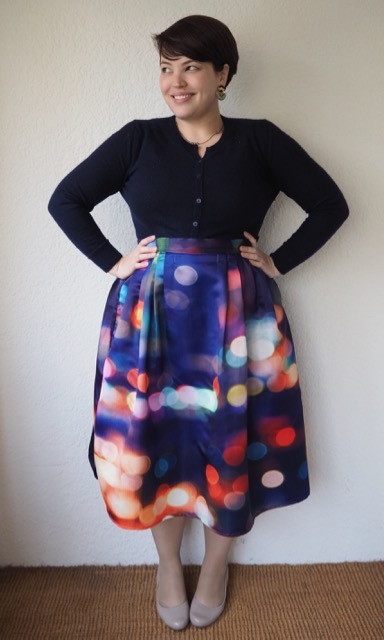 But it kept popping up on my Pinterest feed again and again with all of its rainy-nightness, and confettishness, and glorious rich colours, so when I discovered it had been reduced to just $48 (with free shipping) I couldn’t resist, and I decided to take the plunge and buy it. I’m so glad I did, because there was more the enough material in the pleats to remix it (or “fat hack” as gorgeous Amy from Willow Curves calls it). When it arrived I was pleasantly surprised by the quality of the fabric, if not the quality of the workmanship. The fabric’s a lovely heavy satin, which gives the colours a wonderful glow. The image is printed on to the fabric, but both side seams showed a wonky strip of plain white a centimetre or two wide, which would have really annoyed me if I hadn’t been going to unpick the whole thing anyway. The skirt had pockets (which I couldn’t be bothered to retain), and a petticoat-lining that gave great volume, but was vaguely… I don’t know… plasticky? It rustled like a cheap sleeping bag if you even looked at it sideways. I discarded the petticoat immediately, and to be honest if you’ve got hips you don’t need it; the fabric is heavy enough to give it a bit of fouff. So, no step-by-step tutorial, because the whole thing was a disaster of trial and error as I tried to decide between waistband-vs-elastic/pleats-vs-gathers/box pleats-vs-knife pleats, etc etc. And because I’m an idiot, I trialled-and-errored with the actual skirt, rather than starting with a toile, and close-up you can see where I’ve had to unpick and re-sew half a dozen times in the fabric, sigh. The skirt originally came with a multitude of open pleats, but eventually I decided it would be more flattering on my shape to have a flat front, then six sewn knife-pleats towards the sides. It meant that there was less volume to the skirt, and the pleats would follow the curve of my hips rather than flowing out straight from the waist. Again, you can see from the photo below that the printed fabric has given a little where the pleats were sewn, but I might just go over the seams with a blue fabric pen, and I think it’ll be virtually indiscernible. The waistband is made from excess fabric that I took from the sides of the skirt. 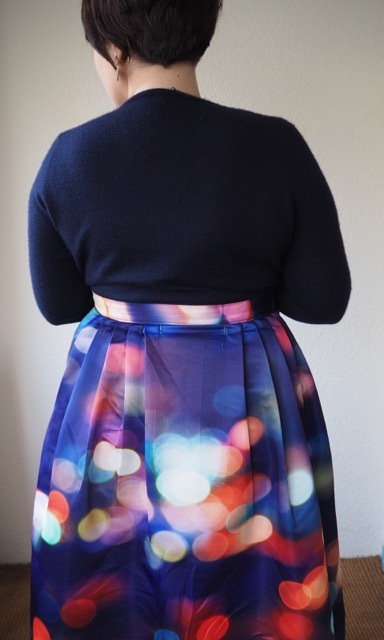 I did the same thing in this DIY pleated skirt tutorial. It’s easy as pie, and honestly if I’d spent less time faffing about being indecisive and trying to make calculations about pleat quantity and size the rest of the project would have been too. So here’s the before and after and don’t think I’m being arrogant, but I think I like mine better! This entry was posted in Remix and tagged cardigan, chicwish, cold, eugenie, remix, skirt by lillipilli. Bookmark the permalink. Oh wow, I saw you in yours on Insta and fell in love with it. Having seen the original in this post though, I never would have even thought about buying it! Looks gorgeous after the remix. I’m so jealous, I wish I could sew!! Lusting after your version now. Thanks so much, Sims! It’s a really easy sewing project though, really! I agree, I like the shape of yours better! Me too, Lainie – thank you! Amazing! 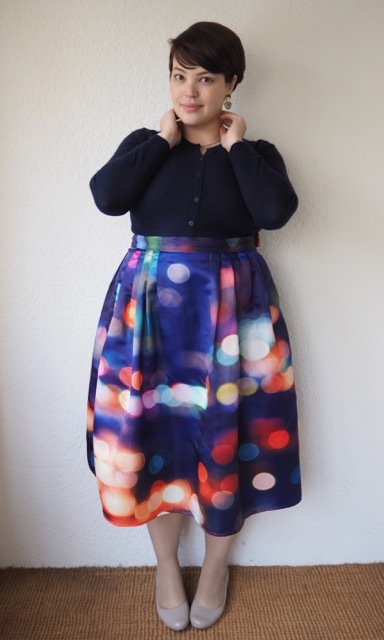 I bought the exact same skirt several months ago during a Chickwish sale, and have been putting off the inevitable “fat hack” until I had more time on my hands. Well, you’ve just convinced me it’s worth it. Thank you!!! Snap! I’ll have to keep my eye open for your own remix! Good luck! Yours is gorgeous! The original is ok, but somehow looks old fashioned (not in a good way!) despite the modern print – I think yours shows off the bokeh much more. Thanks so much, Katie! I think maybe the stock photo that was used didn’t really show it off to it’s greatest advantage. I liked how they allowed regular people to submit their own photos, because the skirt looked SO much nicer on the non-models who were reviewing it! I like yours better too! <3, thanks so much, Geri! I like yours better too, Lilli. It shows of the gorgeous print more than the heavily pleated version. It does, doesn’t it? It’s such a stand-out print, I love it! Your hair is looking particularly snazzy in these photos! Ah, but these are the APPROVED photos! I’ve never really had “BAD” hair days until I had short hair… but I’m still loving it. What a super fun skirt! And yes, yours looks better. oh my god your remix of the skirt is so much better! I’m in love with it! I’m considering getting this, but I have no waist (rectangle/brick shape here) and look horrible in midi skirt. 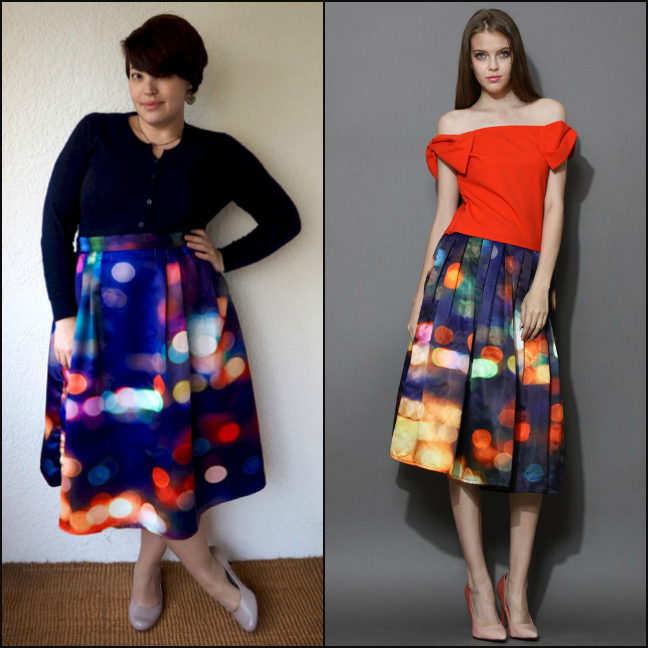 It would be SO easy to hem it shorter Chel – promise!